Hello, my name is Helen. Sometimes I also call myself the little card maker! I live in Melbourne with my husband Duncan and our two young children. Duncan is very much the other half of the little card boutique and together we make beautiful handmade cards. I was brought up in Melbourne and Duncan in England. We first laid eyes on each other here in Melbourne over 10 years ago and we have been inseparable ever since. We have lived abroad and were married in England in a gorgeous old church built in 1845. We love to travel back there as often as we can, to love up our family, visit castles and to swoon over the English countryside. I have always had a great love of paper and stationery. When l was 11 I connected with a pen pal in the United States and we have written to each other over many years. We sent countless cards in sometimes scented envelopes, adorned with stickers and our secrets filled pages of printed lined letter paper! I think my love affair with paper started then. But before the little card boutique was actually dreamed of I had completed a Business degree in Marketing, took storytime sessions at the library, worked heavily in customer service and I have wonderful memories of working in the United Kingdom while helping Duncan to renovate his English terrace home on Lavender Avenue. We make cards. Gorgeous handmade cards for all those special occasions we all love to celebrate. Also, a big part of what we create is bespoke. Made to order stationery for weddings, a darling new baby or special anniversaries. My first love when it comes to my craft is beautiful cardstock which is mainly sourced from Australian paper merchants. Gorgeous textures, classic laid or shimmering finishes... l love it all! I have stacks of paper in my work studio, to admire and inspire me. I am totally committed to using the best materials I can find. Luxury heavy weight cardstock and beautiful matching envelopes make my heart swoon. My next love is printed paper and l love the colour red, which you will find in many of my designs. l just love adding beautiful treasures to my cards such as lace, paper roses, vintage brooches which l hand sew into my cards, glitter and especially buttons... yes, especially buttons! My inspiration is often formed by the materials that I use. I describe what I do as interior design with paper. I know instantly if I love a material and even if I don't have plans for it in that exact moment, I always pick out what I love for a later date. I don't draw out my designs, but I do dream in paper. 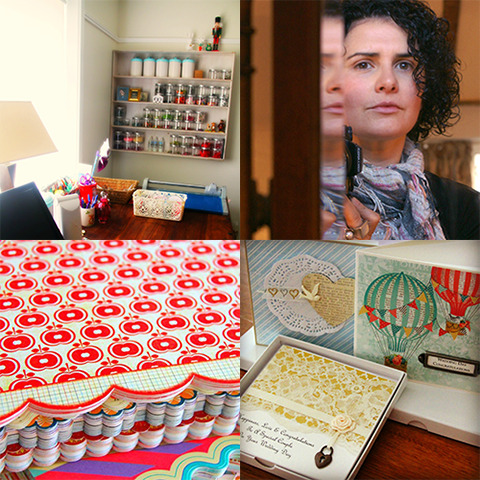 I am always designing in my head, coordinating paper and beautiful embellishments and composing sentiments. From there, the next part of the process begins. I lay the materials out on my table. I cut, fold and print. Then I bring them together again and finish the design. The creating is often fast because by that time the completed card has been well formed in my imagination! Having children, plus years of being in business and a heavy work load has meant that my creative process has become very efficient! At times some of my best and most popular designs have come from developing a bespoke card for a customer. So, my customer base is also a big inspiration for my creative process. I have always loved art and I love being creative. Handmade gifts, writing poetry, crochet, knitting and making doll clothes when I was little! I have memories of making Christmas cards when l was younger for cherished neighbours. Then when Duncan came along and stole my heart l would make him lots of mushy cards to celebrate almost any anniversary l could think of! My first major creative job was making our wedding invitations! Stamped hearts, crystal rhinestones, shimmering ruby paper and cream laid cardstock. Next, I started to made cards for friends and when our eldest arrived... I spent many many hours settling him to sleep and my escape was dreaming of designs. It was then I really started to make cards and applying for craft markets in Melbourne. People loved what I was creating and that fueled the fire even more! the little card boutique - When we started to attend craft markets I just loved to set up our little stall like a beautiful gift boutique, pretty plates filled with gift cards, flowers, white display stands and wicker baskets. My long term plans have never included anything big for my business. I just want to make cards. So to include little in our business name was a must... l love that we are home based with our children close by, with Duncan and I taking care of design, cutting, assembling, packing and selling. Then the use of the word boutique... well, I just love anything pretty and boutique to me makes me imagine a gorgeous little shop, with lots of treasures, the paper kind! I have always been a bit of a loner in this respect. l am self taught and I rarely visit card blogs or read card making magazines. But I really do love talking business! I love to connect with other handmade businesses at markets and get talking about cool new markets, merchandising and sales. I have also developed some great friendships with other makers, including other card makers online. When you work from home, online can often be the only opportunity to connect, learn or find an answer to a question fast! I am a member of many business groups on Facebook who support each other and like to chat about marketing, social media and customer service. I also love pages like Build a Little Biz and Create and Thrive. These are two fabulous examples of pages with lots of great tips specifically directed to the handmade industry. Find a craft that you love. Do something that you enjoy and that you are totally passionate about. This will show in your product and when you discuss your latest make to a potential customer. I always recommend attending craft markets at the beginning. Get out there, set up shop, hear what people have to say about your product, listen to them very carefully... this helps you to refine designs, look at pricing realistically and be inspired even more. There is nothing like the buzz of a busy market and people loving what you do right in front of you! Customer service, be amazing! Be the sales person to your own customers that you would love to serve you in a store. But mostly l would suggest to be yourself. Be inspired by your own creativity, by the materials that you love, your own ideas and make your product unique to you and your brand. Be your own voice, people will love you even more for it! When l first started making cards we loved to attend craft market with our creations and we still do! Craft markets are a fabulous and fun way to promote your product. Hand out business cards, test out that item you are iffy about and talk to people. A great opportunity for others to see and feel your product. Be proactive - don't wait for buyers to find you! Attend markets, get online, connect with people who love handmade products and other businesses. Start a Facebook page, get pinning your designs on pinterest and right now l really love Instagram. Talk about your designs and your craft daily. Me time. I still struggle with this on a weekly basis. I sometimes have to pull myself away from creating and go for a walk, take a break and eat lunch! I love to cook, nothing fancy, just wholesome food from scratch. I love hanging out with Duncan watching Grand Designs, setting up train tracks with our youngest and going to the library or getting arty with our eldest. I love the simple things, the walk to school, being a homemaker and chatting on the phone! Music, l love George Michael, Moby (loud), Cyndi Lauper and house music from the 80s. TV shows, when the kids arrived Duncan and l lost access to the tv to ABC for kids! I do watch some drama series in my work studio. Recently I have been watching Anne of Green Gables, Grey's Anatomy, The Good Wife, anything British, Call the Midwife, Downton Abbey, Escape to the Country and Grand Designs! Websites, l love following the Becoming Minimalist blog, it is an inspiring blog that talks about living simply, which is what l have been striving for even more lately. Books, l don't get to read many books these days. But some of my favourites are The Alchemist by Paulo Coelho and La Cucina by Lily Prior. Thanks to my kids I'm also a big fan of The Gruffalo by Julia Donaldson. I also love reading The English Home magazine. It fulfills my one day, English cottage fantasy! I am a total homebody! My perfect day would be pottering around the house, eating homemade pizza and sitting outside in the garden with my family. I also just love to lay on the trampoline in the sunshine, which we also nicknamed the office! Silver Spoon Vintage Beautifully made product, great photography, fabulous business woman and mum!